Do you have a special tradition surrounding birthdays in your family? As a family we keep it very simple: family time, special gifts and special food, some friends. When I had only two children then I had little things that I liked to do for them on their birthdays: a string that led from their bed to their gift, with little messages of love tied to it along the way … picture clues to follow around the house and garden in order to find their birthday gift … fun things like that. And then our family got bigger and busier and birthdays slipped past without much acknowledgement for a while there. With three children, I want birthdays to be special and treasured but at the same time I don’t want to make a big deal out of birthdays, and I don’t want to have to organise a party for each child every single year either. Because I am the one who does the organising. 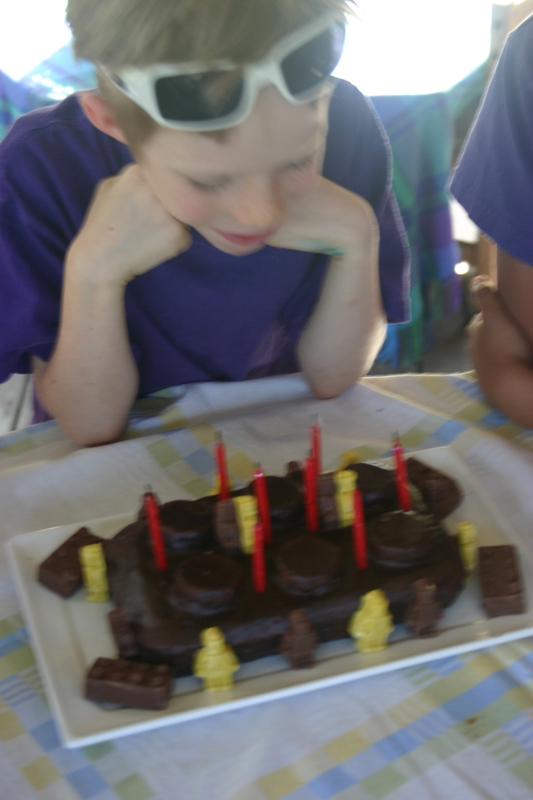 This was the first year I have ventured into an organised party for one of our children. The Lego party was a bit of fun, and we are having a little High Tea for my daughter and a couple of her kindy friends soon. It isn’t something I plan to do each year, but I had fun putting them together this time, particularly once I let go of the idea that every special person you know must come to the party and birthday parties must be held on or near the birthday! My son’s party was held two months after his birthday with a handful of his friends from school, and my daughter’s will be held nearly a month after her birthday, again with just a few of her chosen friends. I’ve also let go of the need to supply party bags – a small hand-made thank you gift perhaps .. but a bag full of lollies and cheap loot doesn’t appeal to me. I don’t like giving things to people if I know they are going to be broken or lost within the week. Although we haven’t yet developed a consistent ceremonial tradition surrounding birthdays within our own family it is still a very special occasion. I do celebrate their birthdays at playgroup, and my children’s schools also hold special little ceremonies for them too, so we are well versed in ceremony design and preparation in this family! 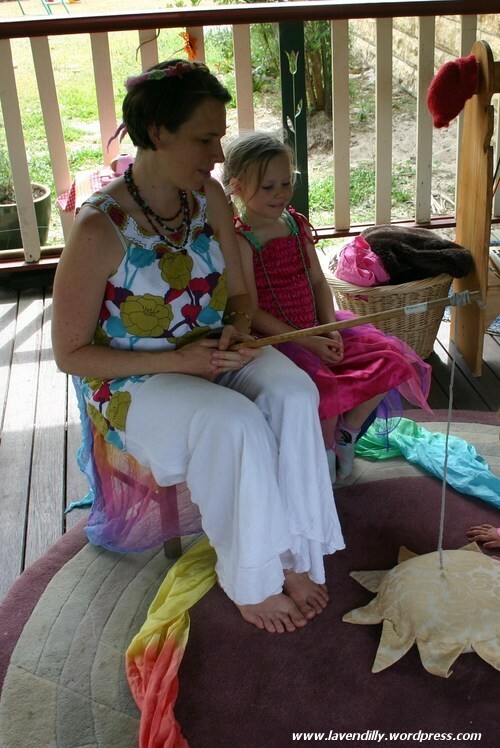 It was my own birthday recently and my daughter spent a long time preparing a special rainbow throne for me to sit on, inside a rainbow circle. She crowned me with a garland of flowers and gave me a fishing rod so that I could fish for my dreams, then the family sang our favourite birthday song. I was very touched at the care and attention my five-year old put into this – for me! Of course now I plan to re-write our playgroup birthday ceremony for next year to incorporate her fishing rod idea. Sweet child! At the moment our playgroup birthday ceremony is short and sweet: with little ones aged between 1 and 5 years old, and with lots of birthdays to celebrate through-out the year the ceremony can’t be too complicated at playgroup. If they were all a bit older I would indulge some time in a story or a puppet show – my daughter’s kindy do a puppet show for every birthday and despite the fact that the children have seen it many many times, they still sit there spell-bound as the story unfolds. Birthdays are so very special and ALL the little gestures we make to a child on their birthday are remembered and treasured. My birthday ceremony takes no longer than five minutes. Here it is: I lay a golden cloth over our circle mat and place a golden sun pillow in the middle. Upon the golden sun pillow is a rainbow crown. The birthday child can choose to sit in the middle and wear the crown or sit with their parent to receive the crown. 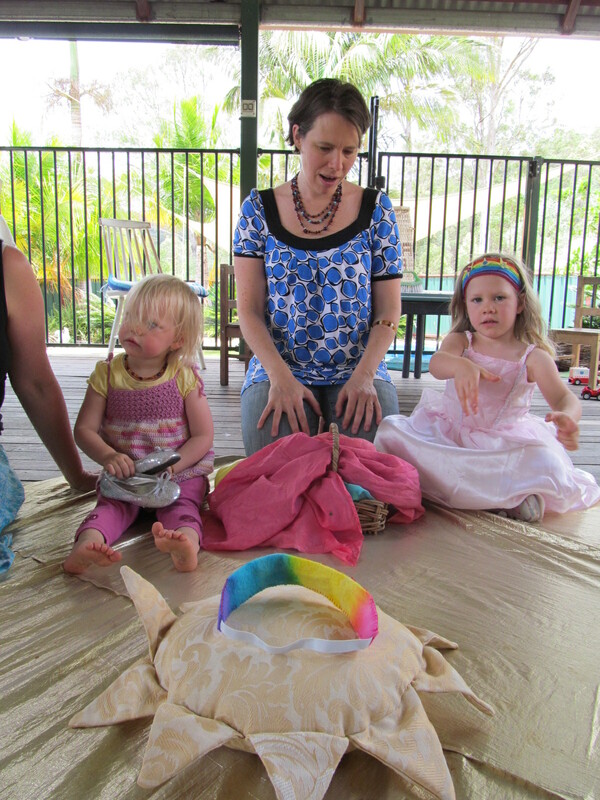 As I sing the rainbow birthday song I wrote I unwind a long silk rainbow cloth (5m length) around the sun pillow. Then I sit down and invite my helper to wind the music box we have that plays “Happy Birthday”. It is so soft everyone has to be really quiet to hear the fairy music, then in our fairy voices we sing Happy Birthday to the birthday child. I light a candle kept in my basket, and they blow it out. That’s all! Then we go wash our hands to eat. Here we are with the gold cloth, golden sun pillow, the rainbow crown (which is made individually for each child as a gift) and the basket with the silk and other goodies. With many who love me.